Four different fruits all grow on just one of Sam Van Aken's fruit trees. Those fruits include plums and peaches. They include nectarines and cherries. The trees blossom each spring. Each tree offers several colors. They include red, white and pink. The artist calls his creations the Tree of 40 Fruit. The tree is at Syracuse University. It really does bear 40 or more kinds of stone fruit. So do others like it. That is thanks to carefully planned grafts. The hybrid trees provide both juicy fruit and food for thought. They preserve agricultural heritage. Van Aken wants to provoke a response most of all. "When somebody happens upon it and they see it blossom in these different colors and they see it growing all these different fruit ... there is this rethinking. There is this sort of moment that sort of interrupts the everyday," said Van Aken. He teaches art at the university. 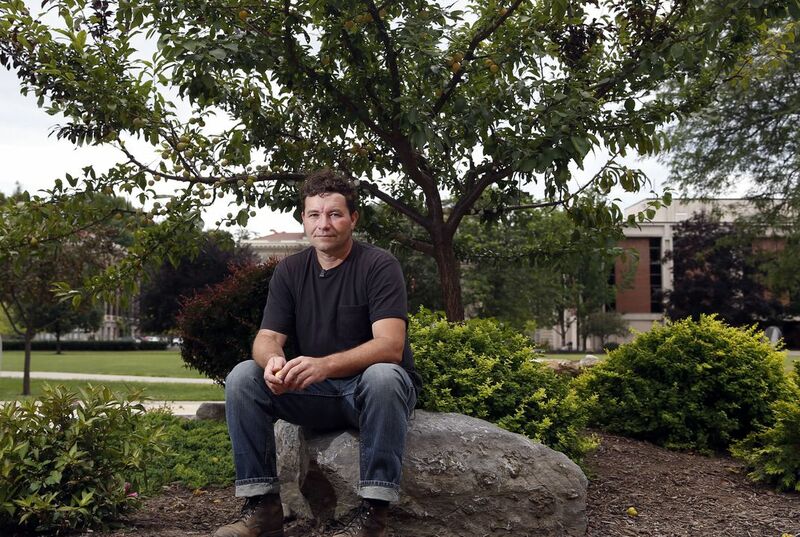 Van Aken's first 40-fruit tree has been located on the edge of a campus green. That is for the past four years. Van Aken plucked a few yellow plums the size of golf balls on a recent summer day. Then he ducked under a low branch to give a trunk-to-leaf tour. He started with a plum rootstock. Over the years he has grafted on a cornucopia of fruit. "Right here is a nectarine. It comes out on a plum base. But it continues to grow up here, until you have peaches on the end," he said. "There are a couple of apricots that have been grafted on. And this out on the end is a red-leaf plum variety." The tree project is an outgrowth of Van Aken's work as a sculptor. He is used to working with nontraditional materials. He considered arranging different trees that blossomed at different times early on. That was before he realized he could "collapse the entire orchard on to one tree." He decided to work with stone fruit. Stone fruit is fruit with pits. "It actually started with a Tree of 100 Fruit," he said with a laugh. "I was sort of ambitious." He eventually settled on 40. The number is rich with biblical allusions. That is such as the 40 days and 40 nights of rain when Noah built an ark. And it is the amount of time Jesus fasted. Van Aken was inspired to include harder-to-find fruits after reading a century-old book. The book is called "The Plums of New York." The book listed hundreds of varieties. 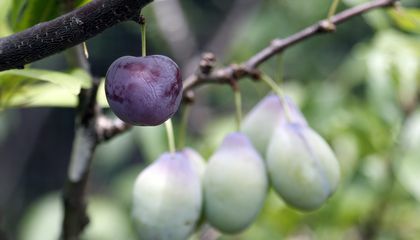 The wealth was very different from the few types of purple plums found in modern supermarkets. He stocked the campus nursery where he works with antique and heirloom varieties. Those include some from a now-defunct research orchard. He has collected more than 40 varieties of plums, peaches, nectarines, apricots, cherries and almonds. He can graft each to his trees. The trees can turn heads in the spring. The multicolored blossoms signal something unusual. But people who walked by the Syracuse University tree on a recent day barely looked up from their phones to notice. University employee Karen Davis said she had heard of Van Aken's tree. But she said she walked by it at least twice a day without realizing it. "I heard about the tree but I didn't know it was right here," said Davis. She called it "fantastic." Van Aken said there are 16 trees sited around the nation. Most of them are in the Northeast. More trees are being grown and grafted in the nursery. They include eight that will be planted in downtown Syracuse next year. Syracuse is in New York. Several of the trees have been donated. The cost of the others depends on Van Aken's travel costs. Each tree is planted with 20 varieties grafted to it. He returns twice a year for three years after each planting to graft the rest of the varieties. The trees keep him busy April through September. But he likes the fact that this is a unique type of sculpture. It just keeps on evolving. "Every year it is something different. It appears different. It is radically different than it was six months previous," he said. "And that part has been the most rewarding part." How is the tree a work of art?